Tucked away and hidden from most casual passersby, the British Museum’s latest exhibition Hoards: The Hidden History of Ancient Britain is much like the once-buried treasure it displays. 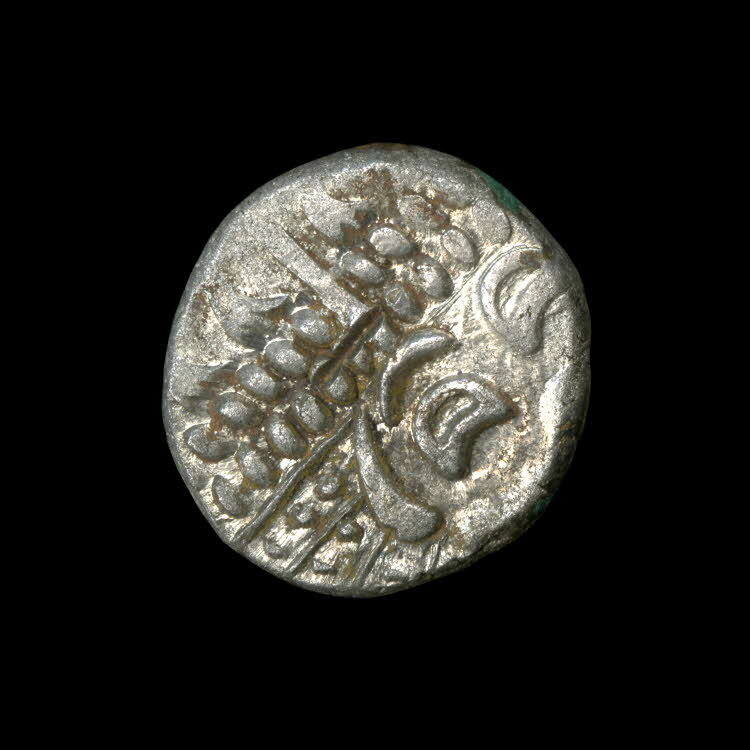 I found it in a small room located on the edge of the ancient Roman gallery on the museum’s second floor, adjacent to the Department of Coins and Medals study room. Despite its size, it holds a wealth of knowledge about this fascinating practice of prehistoric and Roman-era Britons. Image © Trustees of the British Museum. 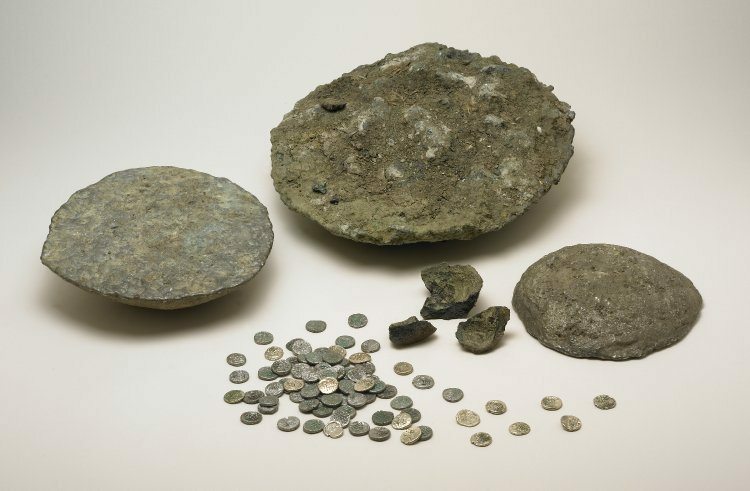 The exhibition is part of a research project by the British Museum and the University of Leicester that examines coin hoards from Britain’s Iron Age and Roman period and provides a new look into the purpose of these puzzling remnants of the past. We use the word commonly in English, but the word hoard has a specific meaning when used in an archaeological context, referring to a collection of objects purposely buried under the surface of the ground or water. These purposes vary from the mundane, such as hiding money from would-be thieves, to more mystical, with many hoards thought to be buried for ritual purposes. Hoards most often include coins, but can also include pottery, weapons, and other objects their buriers considered significant. Alan Graham excavating the Frome Hoard. Image © Somerset County Council and British Museum. Hoards have been found all over the ancient British landscape, from Dover to Dundee, but they are most densely concentrated in southern England and the Midlands. Hoards dating from 260 CE to 296 CE are especially common in Britain, coinciding with a period of extreme inflation and instability within the Roman Empire and the territory itself in the later days of Roman rule there. Previous researchers theorized that people buried money due to the economic and political threats they faced during this period. However, the exhibition shows how a recent discovery of over 52,000 Roman coins valued at £320,250 in the historic English market town of Frome has caused researchers to view these in a new light. 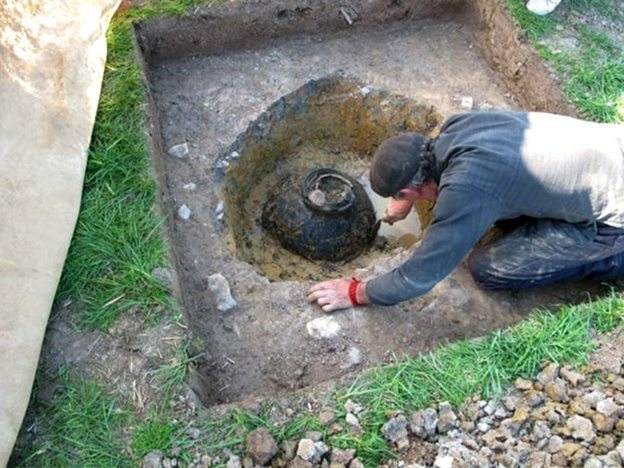 Buried beneath the gentle green fields of southwest England, a treasure trove of coins from the Roman period awaited archaeologists for millennia until its discovery in 2010. The hoard, contained in a single pot, was so heavy that it would not have been possible to remove it from the ground without breaking the pot itself. The researchers who created the British Museum exhibition believe that this may suggest that its buriers never intended it to be removed in the first place. If it were meant to be recovered later, during a safer and more stable time, why would it be buried in such a way? This leads the team to believe that the hoard was not buried for safekeeping, but for ritual purposes. The Frome Hoard bursting with coins. Image © Somerset County Council. What is even more intriguing is that the site was used again for at least one more silver coin hoard an entire century later. Although it is easy to overlook this number given the immense length of ancient history, we should put this in perspective: this is the equivalent of returning to a spot where your great-great-grandparents buried a pot of money back in 1916. There must be some sort of deeper meaning behind this behavior. This certainly lends credibility to the researchers’ case for the hoard being part of a continued ritual practice rather than just a simple stash. 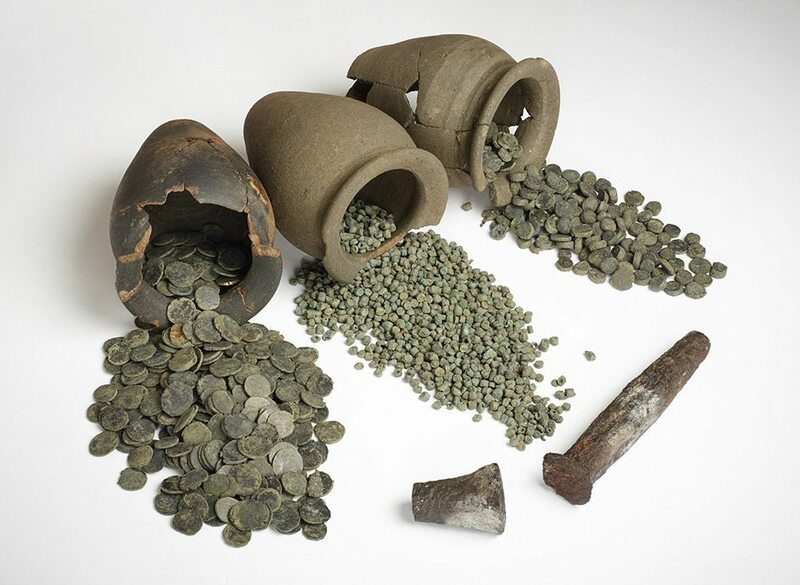 Hoards also features a number of coins and weapons from other Roman and pre-Roman British hoard sites. One that caught my eye was from the first century BCE on the Isle of Wight. The coins feature cuts and gouges made across the head on one side and across the horse’s neck on the reverse side. 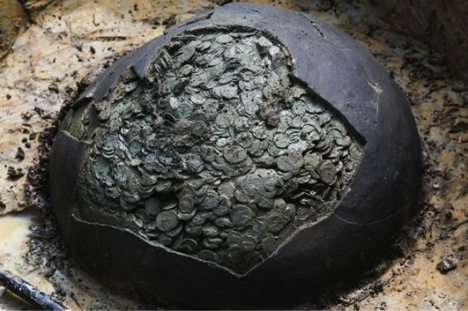 Researchers posit that this may have been part of a ritual “killing” of the coin. Sure enough, when I peered at the coin in the glass case, I could see distinct cuts in the center of the coins. Who knows what possible rituals could have required such symbolism? Not all of the objects at the exhibition were small like these coins, however. The exhibition contained several artifacts from the Bronze Age, as early as 1500 BCE. Roughly the same amount of time separates our era from the Roman hoards as separates these Bronze Age hoards from the Roman ones! 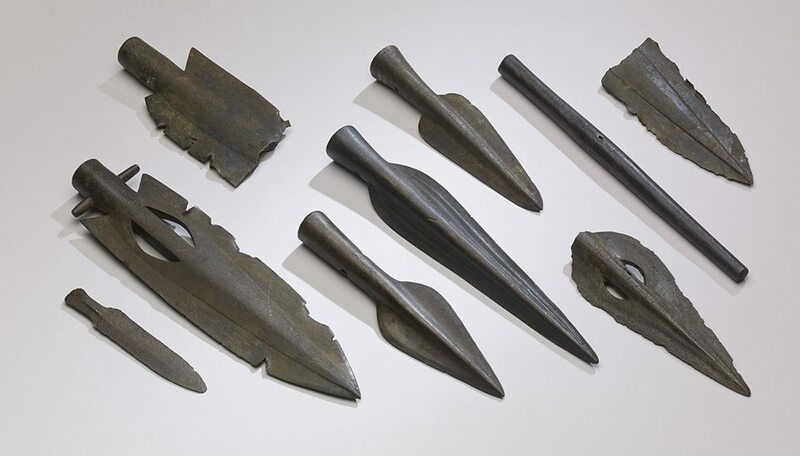 Several impressive dagger and spear points that were thrown into the River Thames and were eventually found in the Broadness Hoard. Image © Trustees of the British Museum. Several of these artifacts were recovered from the beds of rivers, including the famous Thames. The Salisbury Hoard was discovered at Broadness, featuring numerous spears, daggers, and shields from the earlier Bronze Age. These, too, are thought to have been buried for ritual reasons, likely thrown into the Thames in an offering to river deities. Several of these shields are miniatures, making it clear that they were not created for battle but for symbolic purposes. 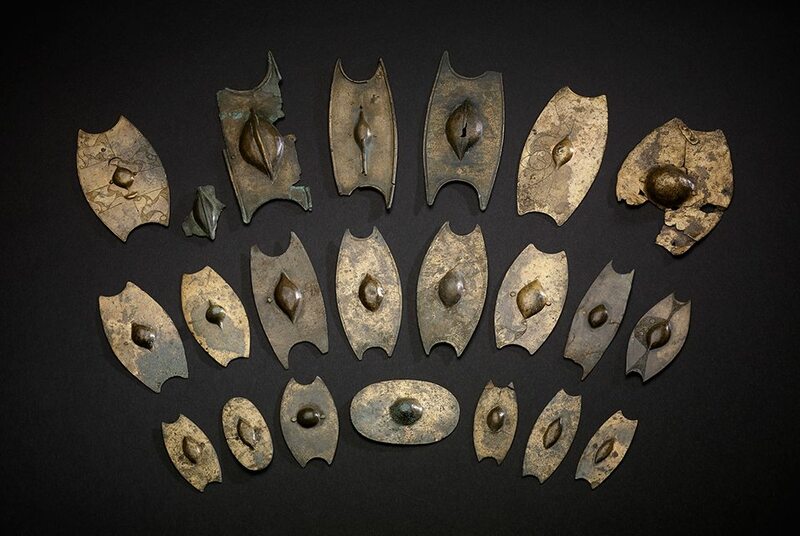 A collection of miniature shields from the Salisbury Hoard. Image © Trustees of the British Museum. New discoveries of hoards each year make this an exciting area of British ancient history to study. Hoards provide endless intrigue for modern viewers, who can only wonder exactly why these treasures were left behind by their original owners. This exhibition will be open through May 22, 2016. Admission to both the exhibition and the museum overall are free. Have you visited an exhibition that impressed you recently? If so, why not write about it for AHE?